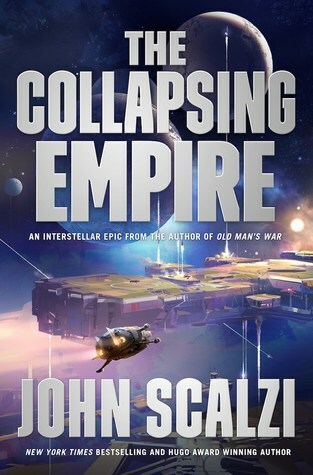 John Scalzi makes his return to Space Opera with ‘The Collapsing Empire’, the first in the Interdependency series (set to run through 2027… Just a decade, no biggie). Not having read his Old Man’s War series, but having heard plenty of great things about it, I knew I could trust what reviewers are saying about this one and not be disappointed. First off, I listened to the audiobook for this one, as I do when I come across narrators that make the books more enjoyable for me. Wil Wheaton (pronounced Hwill Hwheaton for you Family Guy fantatics) does a fantastic job, as usual, and it just helps the overall nerd thrill to have Wesley Crusher from Star Trek reading Space Opera. Patrick Stewart is the only other person I would consider, but I’m not sure he could pull off female voices. There are plenty of things to like here. Scalzi’s wit, political intrigue, murderous plots, and a new way of way of star system travel known as ‘The Flow’. Since the universe is still bound by the laws of physics (no faster than light travel), Scalzi has introduced a network between connected systems to create quick travel pathways. All pathways go through the Interdependency, aptly named because all settlements connected via The Flow need one another for survival. After Earth is cut off from The Flow, few real civilizations are left and the pathways are beginning to shift more often. The only things that I didn’t enjoy, which I assume Scalzi will fix in the next installments, were the characters. Most fell flat and were unlikeable to say the least. Most were of the ‘no f@#ks given’ variety, and there were definitely plenty of f-bombs to go around throughout a lot of the dialogue. Having said that, I did enjoy Lady Kiva’s brash way of getting things done. You either have sexual dominance over someone or you scream cuss them until they do what you ask. I am looking forward to continuing the series and I am sure that Wil Wheaton will continue doing the audio which is completely fine by me. I liked the first one but it fell into the “Missed It By That Much” category for me (I’m also one of a very small minority – maybe of 1 – that feels Scalzi is over-rated). The VERY BEST thing about the 1st book was Kiva. I would have read through that book just to get to her chapters. I think I read somewhere that she’s Scalzi’s favorite part of the book as well. You’re fine! Yeah, haven’t gotten to it yet as I haven’t seen any ARCs flying around. Will probably grab the audio when it hits.